However, most people don’t realize exactly how rudimentary (i.e. dumb) A.I. is in it’s current state. This is part of the problem with the MIT list. The technology is prone to biases, many false positives, difficulty with simple situations, etc., etc. The problem is more humans trying to make use of and/or make critical decisions based on immature technology. For those of us that work with it regularly, we see all the limitations on a daily basis, so the idea of A.I. taking over the world is a bit laughable. In fact, you can see it daily yourself on your phone. Take the auto-suggest feature on the iPhone. 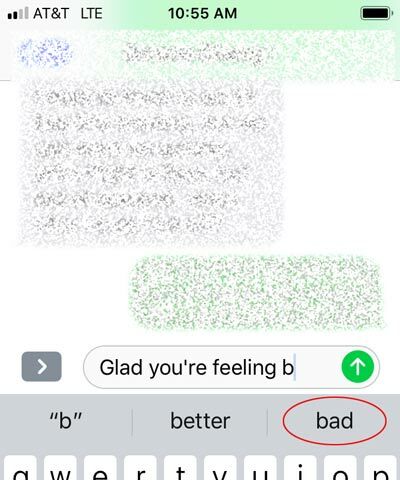 You would think the Natural Language Processing could take a phrase like ‘Glad you’re feeling b…’ and suggest things like better, beautiful or whatever. Not so hard, right? How often does ‘glad’, ‘feeling’ and ‘bad’ appear in the same sentence? And you want to let A.I. drive your car? Unless, of course, it’s a human problem again and there are a bunch of asshats out there that are glad you’re feeling bad. Oh, wait… it’s the internet. Right.